60 years ago, if you had even a tiny tattoo of a UFO on your foot, you’d be considered an outlaw. Good luck trying to land a job in the 1950s with any amount of ink deposited under your skin. 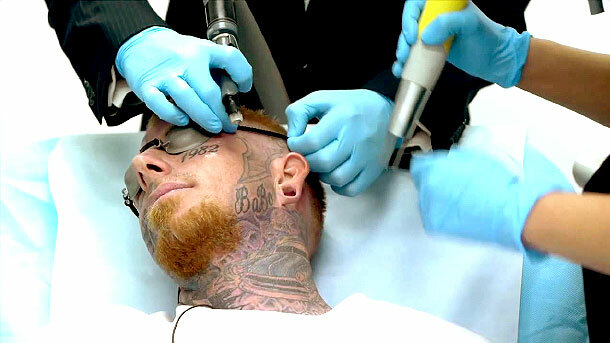 Nowadays, we talk about face tattoos. The dude you need to get to know for this story to make sense is Justin Spakowitz, and he’s basically just your average Joe. The only difference is that he just so happens to have a bad reputation, on the sole account of the tattoos on his face. The thing is, he’s fed up with the discrimination he faces (no pun intended) on a daily basis, so he decided to sack up and get those suckers removed. Even though this is assuredly a million times more painful than actually getting tattooed, he takes it like a champ.